We are offering Designer Inlay Tiles which are high on quality and famous for exceptional finishing and smooth texture. We use fine methods to develop them and they are provided in varied designs, patterns and color combinations. Further, these are known for high durability, beauty and elegance. 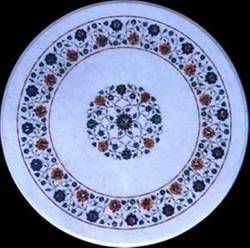 Unique white marble tile inlay with natural semiprecious stones and its fully handmade.We will give you display stand complimentary with the Tile.You can use it as a wall Tile, serving plate, cheese platter etc. 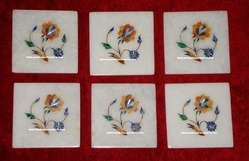 Being a most reliable organization, we are engaged in offering a wide range of Marble Inlay Floor Tiles. Our clients can avail from us an extensive range of Purple White Marble, which is highly applicable and used for sculpture. Due to its smooth & glossy texture, this marble is considered ideal for flooring of residences, hotels, commercial places and others. Purple White Marble offered by us exhibits outstanding beauty and can also be availed in various thicknesses & configurations. We offer high quality of Inlay Column Abu Dhabi Grand Mosque Project. We are a unique entity in the industry, actively committed to offering an optimum quality range of Marble Inlay Wall Tiles.